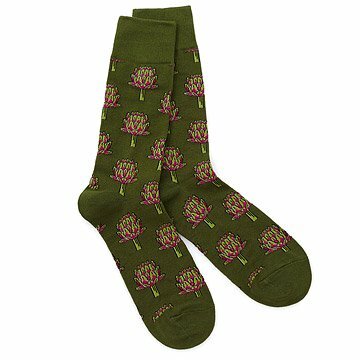 For those who love the farmers market, these charming men's socks are dotted with artichokes. Perfect for seasoning a simple ensemble, these comfortable accessories are anything but garden variety. Made in South Korea. These socks were a great gift for a vegetarian who has everything! Soft, comfortable and fun. Make sure your ensemble is always in season with these charming artichoke socks.